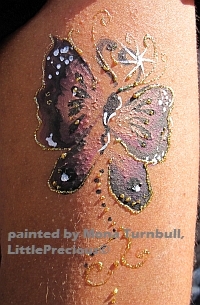 I can face paint approximately 10 children an hour for good quality faces, I can also paint more faces of less detail in an hour - a bit longer for adults. Please bear this in mind when making a booking. Please contact me via telephone or e-mail. I would be happy to answer any questions you have regarding the services I offer, and happy to provide a quote to suit your requirements on request. A £35 non refundable deposit is required to be paid upon booking for any of my services, this will confirm the date in my diary. The balance is to be paid at the actual event.